A Yamagull and the "Bermuda Around The Island Race"
What you are looking at above is what they call in Bermuda, a "Yamagull" owned by a gentleman named Brian. 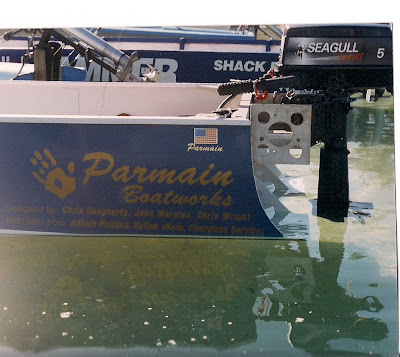 It is a clever marriage of a Seagull outboard with a Yamaha lower unit, a modified exhaust system, and many other changes. So what do you do with this strange hybrid machine you ask? You use it in the "Bermuda Around the Island" race. This is one of the most unique, and interesting boating events out there, and there are also several versions of it world wide. And so this is where the story starts. 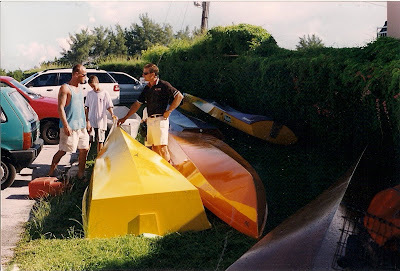 Once upon a time Parmain built boats. This was a most satisfing thing to do, but a very tough way to earn a living. After losing prodigious sums of money, I added boat building to my "Museum of Shattered Dream's" vast collection, and only do repairs now. But back to the story. I get a call from Malcolm, who lives in Bermuda, inquiring if we could design a fast boat for the Bermuda race. 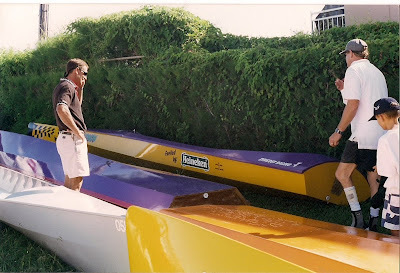 It sounded like a fun project so I said yes, and send me some pictures of typical boats used in the race. 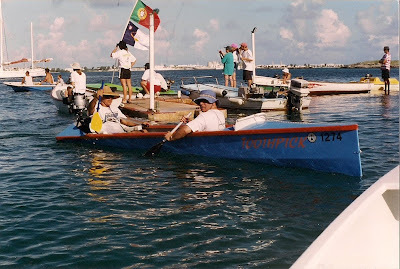 The pictures below are of some of the boats used in the race. They all have long wetted waterlines, are fairly narrow, and you can see the builders have done an excellent job of crafting their vessels with much pride. We started with a design that was very light, and would hopefully plane with 5hp, and two people in the boat. the primary design effort was done by Chris Doughtery, naval architect John Marples suggested widening the bow to improve water flow around it, and my friend Chris Wright who is a structural engineer of great talent, provided input on the construction details. 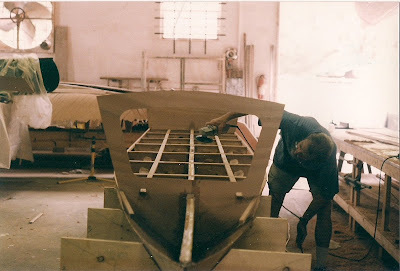 Lloyd's grade 1/8" marine plywood was used to construct the boat, and the bilge areas were hollow. All the bulkheads had holes drilled in them to lighten them. It was similar to building an aircraft wing. The weight was about 100 lbs, it did plane well, and she was a beautiful vessel. 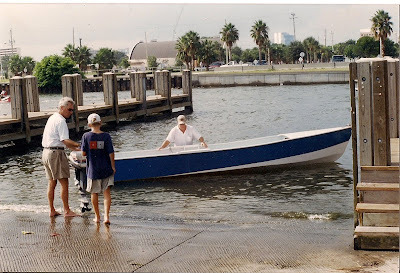 Malcolm flew over from Bermuda, and we tested the boat in Sarasota bay with a borrowed engine. It performed well, and we arranged to have it shipped to Bermuda. 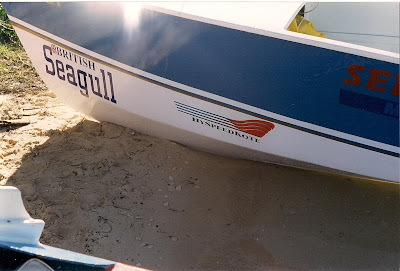 When the boat arrived in Bermuda, Malcolm put the graphics on, and had a mount fabricated for his Seagull. I shamelessly brought over my own graphics when I flew over to the watch the race. You can see some of the Seagull's and steering arrangements. 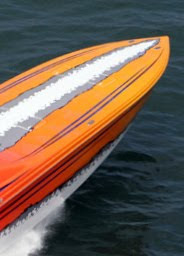 This is Toothpick, another example of racing boat design. This was a most excellent adventure, and Bermuda is a beautiful place. The people I met were fun, and generous to a couple of Americans who were visiting. Malcolm, and his family were wonderful hosts, and we were appreciative of their warm hospitality. The most fascinating thing about the race is the evolving boat designs. I saw pictures of earlier boats, and races, and you could see the designs change over time. I came back the next year, and was pleased to see a couple of the new boats had used some of the design elements that we had used in Malcolm's boat. They are quick learners in Bermuda. I wish that maybe someone like Mercury Marine would put together this type of a race here. I would like to see what a 5hp Mercury would look like if a NASCAR team got a hold of it, and what the boats would look like here. Hmmm, maybe all black string composite construction with hydrofoils . Always check the inlet carefully. Something could be very wrong!. If you click on the lower picture, you can see the insulation has melted off, and the wire has acquired a lovely green patina. Nice if you are a three hundred year old bronze vase, but bad if it's your boat's marine wiring. That's the neutral wire that has been fried. Once upon a time it was white. You can click on both pictures for a better view of the damage. Morons at the gate. Just what were they thinking? Just when you think you have seen it all, you find something new. This started when the owner wanted to install a new stereo in this center console fish boat. Sure, piece of cake, and it will take about an hour and a half. The owner also asked if I would look at the power feed on the boat to the console. He felt that there was some issue there, because things would turn off on occasion. The holes get punched, the speakers and stereo go into them, and I climb into the console to hook up the wiring. Hmmm, no power block, and whats this on the breaker? What the dealer had done was to jumper onto the first breaker the power for the Standard Horizon VHF, Garmin GPS, Hummingbird depth finder, and a couple of other items. All of this was somewhat corroded. Then I looked at the power feed to the console. In the upper picture, you can see the red #10 wire curled up that feeds the panel. That white #16 wire wrapped around the red wire was attached to it. The panel builder was expecting a #10 feed wire, but the boat builder used an under sized cheesy grade white wire to connect to the power to the panel. All of those other white wires you see are also 12VDC positive feed wires. I guess this builder had run out of red wire, and used whatever they had laying around. In the second picture you can see the white wire coming out of the battery switch. Yep, the same cheesy white wire that feeds the panel. The panel was providing power for the electronics, bilge and baitwell pumps, fish box pump, nav lights, and everything else. I think the total possible load would be approaching 20 amps, and all of it being carried on the cheesy #16 wire. At 3% voltage drop the wire should have been at least a #10. Funny, that's what the panel builder thought also, because that was the wire size they used. If I hadn't made the point clearly enough, this was unsafe wiring, and could have resulted in a power failure, or in the worst case possibly a fire. So in the end, I pulled in a new #10 feed, installed a fuse block for all of the accessories, cleaned up some corrosion issues, and life is now safer, and better for the owner. This was a very bad piece of work by this builder, and it appears they have no quality control, or just don't care, or both..
Anchor? We don't need no stinking anchor, or function follows form. Okay, I already know this will not change any go fast boaters opinion about this subject, but I just don't get it. How would you safely anchor this boat in rough seas, if you needed to? I was at a local marina last week, and a very large go fast boat came into the basin, Instead of the typical crew made up of scantly clad young ladies, and swarmy looking guys wearing coins from the Atocha on gold chains, this boat incongruously had a normal looking family on board. Mom, dad, two daughters, and I would guess the grandparents. It was a cold, and very windy day, but the dad gracefully back the vessel into the slip, and a young girl tied off to a side cleat on the boat. She then jumped onto the dock, went forward of the windshield with a line, and carefully jumped from the dock onto the wet deck, and dropped to her hands and knees. She crawled forward to the bow, and attached the line to the bow cleat, and crawled back aft, carefully stood up and jumped back on the dock with the line. Here is the point of the story. There was no real access from the cockpit to the bow, no anchor locker, no handrails, and no real way to anchor this boat from the bow. Now imagine being caught off shore in a bad squall with no engines, what would you do, anchor from the stern? It might be possible in pitching seas to drag a thirty pound anchor along with the rode over the windscreen and crawl out on the wet slippery deck to the bow to do this, but it seems there should be a better and safer way. By the way, stating the obvious, I would never anchor from the stern in rough seas. We just had a recent case where a center console fish boat got caught in a storm, and because it was anchored from the stern, it was swamped, and then rolled over. This resulted in three of the four passengers drowning. It should be no surprise, that boats are designed to point into the waves. The pointy end always does a better job going into waves than the square end. So I just don't see why a hatch couldn't be placed forward on the deck to allow someone to access the deck from inside the cabin, and from there be able to reach the anchor locker, where something other than a "Lunch Hook" could be stowed. I know that safety and practicality get in the way of beauty, and that these boats never get caught in bad weather, or break down. 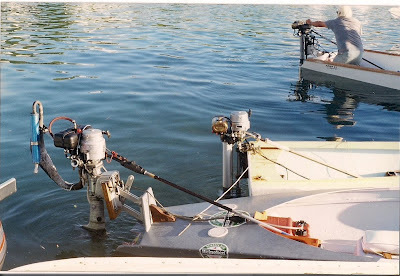 There are go fast boats out there that can be properly anchored, and I don't think they have a bad case of the uglies because there is an anchor locker on the bow, and a hatch to access it. This is the last you will hear from me on this subject, and I hope Darwin is kind to those that own these un-anchorable boats. Anchors aweigh a lot, can you install a winch? This is the bow of a new and large center console off shore fishing boat that often goes into the Gulf of Mexico for fishing and diving. After the first trip, the owner calls and wants an anchor winch installed. It seems it wasn't a lot fun to hand haul a couple hundred feet of rode, chain and anchor up from the bottom of the Davy's Jones locker. So I go over to see the boat, and this is what I found. The shiny thing on the bow is a pop up running light. Just to the right and left of the bow light are pop up chocks, and you can see on the left side aft one of two pop up cleats (you can click on the pic for a better view). So just where would the builder think a anchor winch would go? The hatch covers the entire locker! Apparently they didn't think anyone with a large offshore fishing vessel would want one of those new fangled anchor winch devices on their boat. Popeye didn't need a winch on his boats, but then he had lots of spinach. Unfortunately the owners didn't have any cans of spinach on board. All is not lost, and there is a way to solve this problem. I will show you the results in a couple of weeks. A little design forethought by this builder would have saved this owner some real money.